This is an ideal gift set in trial, travel-friendly sizes. This 4-piece box provides all the essentials for an easy-peasy wash day. Two of the items can be used to re-moisturise and protect beyond wash day, as well. 1) Moisture Silk Sulfate-Free Shampoo (100ml)–Sulfate-free doesn’t mean runny or lather-free. This creamy shampoo is rich in lather and helps to detangle while it cleanses. It effectively removes dirt, product buildup without stripping the hair of its moisture. In fact it helps put that back in with Vitamin B-5 and silk amino acids. 2) Avocado Smoothie Hair Conditioner (100ml)–This rinse-out conditioner is a creamy concoction designed to work like a green smoothie made for the hair. It has great slip and leaves coils replenished and smooth. It is coconut oil-free and instead uses hempseed oil, which is known to help itchy scalps. 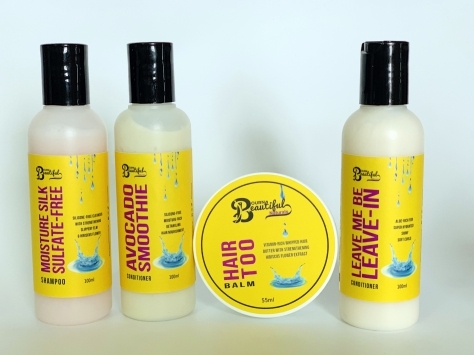 3) Leave Me Be Leave-In Conditioner (100ml)–this silicone-free and glycerine-free leave-in conditioner provides an excellent protective base for any styling product (like Curl, Please! Curling Custard), but it stands on its own as well, sealing the hair cuticle with aloe vera juice and a touch oat protein. It is also lightweight enough to be used as a daily moisturiser, with a sealant. 4) Hair Too Balm (50 ml)–You won’t need too much of this whipped buttery oil. This bomb balm contains sweet orange, which is naturally anti-bacterial and helps increase circulation (great for those who like to oil their scalps). Made from a combination of natural butters and oils, it is soft to the touch and melts upon contact, so as not to weigh the hair down. Ideal for children. As a bonus, it can be used all over the body as well.